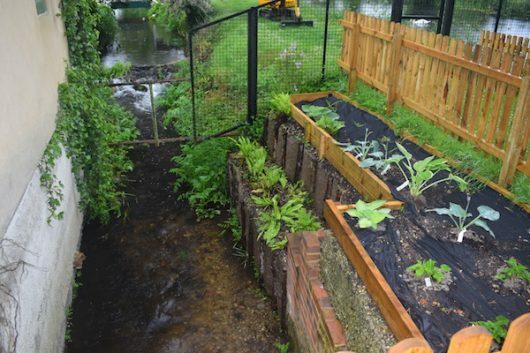 We were called to carry out the repair of a short section of hard engineered bank which had partially collapsed into the stream and was threatening to block the culvert inlet within the grounds of a private house in Fordingbridge. Had the wall collapsed it could have blocked the culvert leading to localised flooding. Temporary works using concrete and sand bags had been installed to protect against any further short-term erosion but a more robust permanent solution was urgently required. 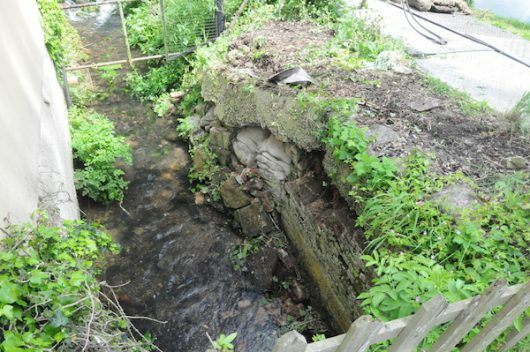 The solution chosen involved repairing and repointing the upper section of brick wall and the installation of two tiers of geotextile-retained ‘coirnet’ revetment. The use of a flexible geotextile retaining material ensures the structure is both robust and has the ability to adapt to movement of the river bed unlike gabion baskets which quickly fail when the bed of the river moves. The chosen solution was designed to rapidly vegetate both on its slope and vertical face whilst remaining highly resistant to wash-out and scour. The completed works successfully reinstated the eroded bank margin around the culvert utilising a robust and aesthetically pleasing solution, which combined both hard and soft-engineering techniques.